So I’m gonna tackle a topic that might be a lil off my usual stuff, but one that is definitely in national attention as well as making local news stories too. It’s something I believe seriously needs addressed. It affects 30% of children making it the most chronic disease of childhood. This number has tripled since 1980. Childhood obesity is a health issue. More children today are diagnosed with diabetes, hyper tension and other co-morbid conditions associated with obesity and morbid obesity. Obesity is defined as more than 20% above the ideal weight for a particular height and age. The physical complications can be great for over weight children. Type 2 diabetes, high cholesterol, high blood pressure, asthma, sleep disorder, non-alcoholic liver disease, and early puberty or menstruation. Besides the over arching problem of physical effects on these children, the social and emotional complications are huge. These children can often suffer from low self-esteem, bullying behavior, learning problems and depression. The risk factors know no economic boundaries. Poor diet, lack of exercise, family factors, and socioeconomic all can contribute to children being overweight. I’m gonna play the bad guy for a second and break up this word. Child…. the first part of childhood. Meaning they are the children who are dependent upon the adult to provide food, provide boundaries and provide guidance. Parents are the ones who shop for food and provide for their child. Good nutrition is so important, but often, parents feel they need to provide empty calorie snacks and drinks for their child. I’ve also watched in my world at times where the children have been allowed to eat unchecked with no reminder “you’ve had enough” or maybe ” 2 cookies is plenty” . It’s really ok for parents to say “no” to kids when they’ve had enough. To teach proper portions. The “no” word isn’t just ok for some things, it’s ok when it comes to teaching children balance and moderation on food too. Children will eat what we bring into the home. If they don’t have junk food to graze on, they won’t eat it. Oh I’m not the totally evil mom, I do have cookies and treats, but when my kids were in school they were the weird ones who had water bottles in their lunch instead of “juice” boxes which are often no more than glorified high fructose flavored drinks. Although my 23 yr old wandered in one day and proclaimed “when you stated getting all healthy the good stuff went away!” ha that’s not entirely true as I still make a mean batches of cookies 😉 but I really keep the snack foods to a minimum. I allowed them to learn and listen to their bodies natural signals. Alongside treats they learned about eating good foods too. We teach our children so many things in life, shouldn’t eating well should be at the top of the list of what we teach them? How do you help if you have an over weight child? → Improve daily diet making small gradual changes. → Offer water instead of sugary drinks. → Encourage exercise and outdoor activities. 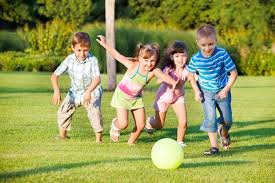 Let your child brainstorm fun ways to exercise. → Focus on the entire family eating healthy and exercising. → Teach balance and moderation in eating. If your child is old enough, encourage them to read the labels, looking at serving size, and measuring it out to help them understand what that serving looks like. →Offer rewards and treats that aren’t food related. → Allow them to have input on the types of healthy snacks and foods they want to try.